Bespoke guitars are wonderful, but can be pricey. against more expensive custom built guitars. A few months ago I looked at the Classic model from British maker Martyn Booth. 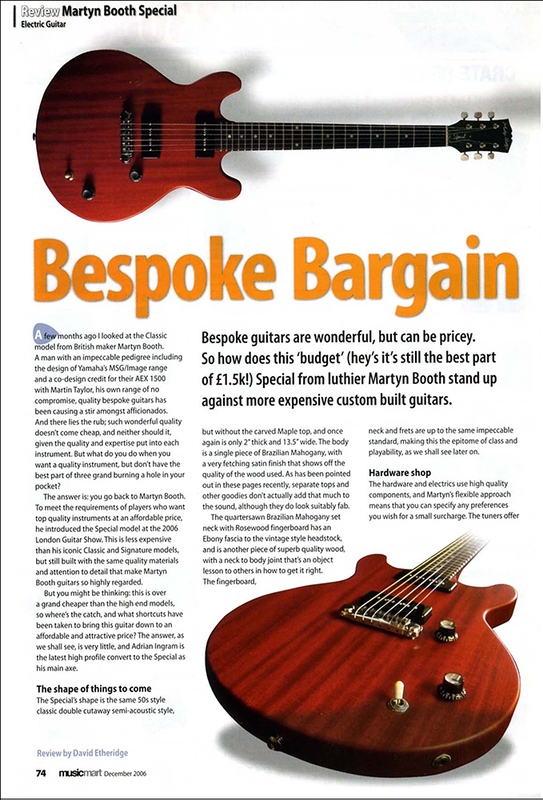 A man with an impeccable pedigree including the design of Yamaha’s MSG/Image range and a co-design credit for their AEX 1500 with Martin Taylor, his own range of no compromise, quality bespoke guitars has been causing a stir amongst afficionados. And there lies the rub; such wonderful quality doesn’t come cheap, and neither should it, given the quality and expertise put into each instrument. But what do you do when you want a quality instrument, but don’t have the best part of three grand burning a hole in your pocket? The answer is: you go back to Martyn Booth. To meet the requirements of players who want top quality instruments at an affordable price, he introduced the Special model at the 2006 London Guitar Show. This is less expensive than his iconic Classic and Signature models, but still built with the same quality materials and attention to detail that make Martyn Booth guitars so highly regarded. But you might be thinking: this is over a grand cheaper than the high-end models, so where’s the catch, and what shortcuts have been taken to bring this guitar down to an affordable and attractive price? The answer, as we shall see, is very little, and Adrian Ingram ls the latest high profile convert to the Special as his main axe. The Special’s shape is the same 50s style classic double cutaway semi-acoustic style, but without the carved Maple top, and once again is only 2″ thick and 13.5″ wide. The body is a single piece of Brazilian Mahogany, with a very fetching satin finish that shows off the quality of the wood used. As has been pointed out in these pages recently, separate tops and other goodies don’t actually add that much to the sound, although they do look suitably fab. The quarter-sawn Brazilian Mahogany set neck with Rosewood fingerboard has an Ebony fascia to the vintage style headstock, and ls another piece of superb quality wood, with a neck to body joint that’s an object lesson to others in how to get it right. The fingerboard, neck and frets are up to the same impeccable standard, making this the epitome of class and playability, as we shall see later on. The hardware and electrics use high quality components, and Martyn’s flexible approach means that you can specify any preferences you wish for a small surcharge. The tuners offer the full retro styling, being the ‘three in a bar’ style rather than the more modern single tuners. These are unbranded Japanese ’Deluxe’ models, but work perfectly. The top nut is hard wearing Tusq (Graph Tech’s brand name of man-made Ivory, fact fans – Ed), while the bridge is a Pigtail intonatable wraparound model with Allen socket locks. Pickups are Gotoh P90 clones, and if the player wishes, options such as American P90s or Bare Knuckles can be fitted if so desired. The electrics are standard fare, with single volume and tone pots and a three-position switch. Once again, it’s all good news on the Special front, with that perfect look and feel that made me wax so lyrically over the Classic model. The finish of Nitro Cellulose (my review model was in a’faded cherry: and others are available) shows off the striations in the wood nicely, and provides a very tactile sensation when playing. Once again, the shape, balance and weight are perfect, with the thin body cutaway contouring very comfortably around your body. I was positively ecstatic about the neck on the Classic model, and it’s the same here on the Special: true and beautifully proportioned throughout and absolutely wonderful to play. This ease of digital dexterity translates right across the fingerboard and all the way up the frets, with that winning cutaway adding to the ease. 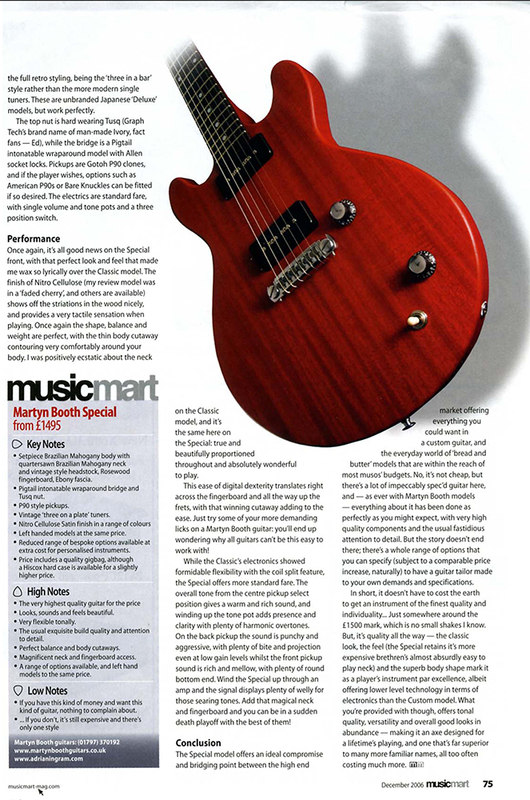 Just try some of your more demanding licks on a Martyn Booth guitar: you’ll end up wondering why all guitars can’t be this easy to work with! While the Classic’s electronics showed formidable flexibility with the coil split feature, the Special offers more standard fare. The overall tone from the centre pickup select position gives a warm and rich sound, and winding up the tone pot adds presence and clarity with plenty of harmonic overtones. On the back pickup the sound is punchy and aggressive, with plenty of bite and projection even at low gain levels whilst the front pickup sound is rich and mellow, with plenty of round bottom end. Wind the Special up through an amp and the signal displays plenty of welly for those searing tones. Add that magical neck and fingerboard and you can be in a sudden death playoff with the best of them! The Special model offers an ideal compromise and bridging point between the high-end market offering everything you could want in a custom guitar, and the everyday world of ‘bread and butter’ models that are within the reach of most musos’ budgets. No, it’s not cheap, but there’s a lot of impeccably spec’d guitar here, and – as ever with Martyn Booth models – everything about it has been done as perfectly as you might expect, with very high-quality components and the usual fastidious attention to detail. But the story doesn’t end there; there’s a whole range of options that you can specify (subject to a comparable price increase, naturally) to have a guitar tailor made to your own demands and specifications. In short, it doesn’t have to cost the earth to get an instrument of the finest quality and individuality… Just somewhere around the £1500 mark, which is no small shakes I know. But, it’s quality all the way – the classic look, the feel (the Special retains it’s more expensive brethren’s almost absurdly easy to play neck) and the superb body shape mark it as a player’s instrument par excellence, albeit offering lower level technology in terms of electronics than the Custom model. What you’re provided with though, offers tonal quality, versatility and overall good looks in abundance – making it an axe designed for a lifetime’s playing, and one that’s far superior to many more familiar names, all too often costing much more. • One piece Brazilian Mahogany body with quarter sawn Brazilian Mahogany set neck and vintage style headstock. Rosewood fingerboard, Ebony fascia. • Pigtall lntonatable wraparound bridge and Tusq nut. • Vintage ‘three on a plate’ tuners. • Left handed models at the same price. extra cost for personalised instruments. • looks, sounds and feels beautiful. • The usual exquisite build quality and attention to detail. • Perfect balance and body cutaways. • Magnificent neck and fingerboard access. • A range of options available, and left hand models to the same price.